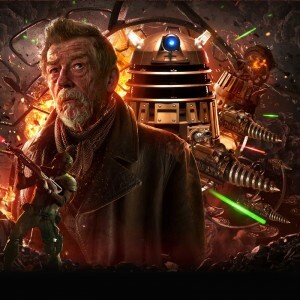 Doctor Who: The War Doctor Returns! The War Doctor was introduced for Doctor Who’s Fiftieth Anniversary, and played a key part in the record-breaking television special The Day of the Doctor, alongside David Tennant and Matt Smith’s Doctors. The audio adventures of The War Doctor will be told over four box sets, each containing three linked hour-long episodes. The first box set is entitled Only The Monstrous, and is written and directed by Nicholas Briggs, whose many successes for Big Finish include the BBC Audio Award-winning masterpiece Doctor Who: Dark Eyes. The cast of The War Doctor also includes Jacqueline Pearce, who plays Time Lord Cardinal Ollistra — an arch manipulator who is waging the Time War against the Daleks. Jacqueline’s work includes The Avengers, Callan, Doctor Who: Death Comes to Time, Moondial and Russell T Davies’ Dark Season, and she is known to many science fiction fans for her role as Servalan in the cult classic Blake’s 7. Only The Monstrous will be released in December 2015, and will be followed in February 2016 the second volume, Infernal Devices, which is written by John Dorney, Phil Mulryne and Matt Fitton. Volumes Three and Four are currently in pre-production. “What an utter privilege it is to work with such an iconic actor, playing such a brilliantly devised role,” says producer David Richardson. “This is Doctor Who at its darkest — the era in which our hero casts aside his core values in order to try and save the galaxy in its most terrible hour. We promise bold and brilliant story-telling with gripping character drama, and epic and cinematic audio productions.” In addition to The War Doctor, November 2017 also sees a prequel box set to the saga Doctor Who: The Eighth Doctor — The Time War, which will follow the early stages of the Time War from the Eighth Doctor’s perspective. Paul McGann stars, alongside characters first introduced in the War Doctor box sets. Previous PostPrevious New Thunderbird Episodes Starring Classic Puppets Are GO!